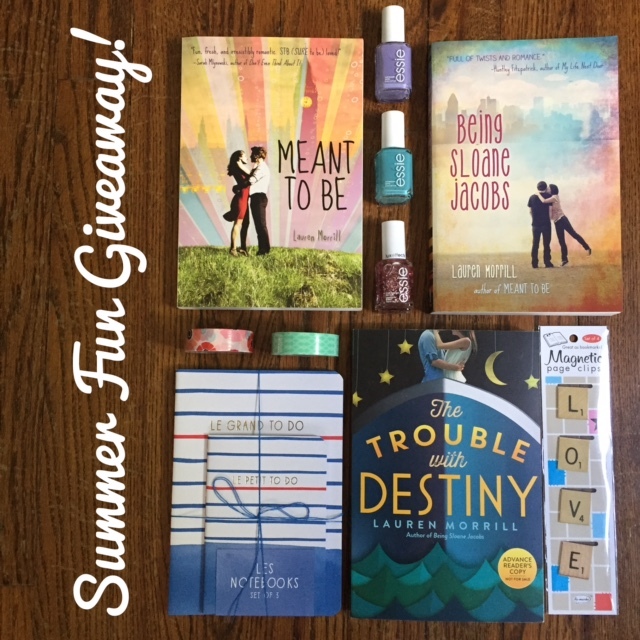 Have the perfect summer day with the complete Lauren Morrill collection, including paperback copies of Meant to Be and Being Sloane Jacobs, and an ARC of my next book, The Trouble With Destiny (out December 8!). Mark your place with the Scrabble tile bookmarks, jot down your summer plans in these cute notebooks, and have some nail art fun with 3 Essie polishes that match the Sloane Jacobs cover! Head on over to Instagram and like this post, follow me, then tag two friends in the comments. Just like, follow, tag! That’s it! I’ll draw a winner on June 20th, which gives you three whole weeks to enter! This contest is US only, sorry international friends! Check back for an international giveaway in December when The Trouble With Destiny drops.